First, let me say that appearance isn’t everything. Our mothers alway told us that when we were in middle school, and well, we all knew it wasn’t true. But, in this case please believe me when I tell you appearance isn’t everything (we have all matured a bit, haven’t we?). This lasagna is one of the more amazing I’ve tasted, and by far the best I’ve ever made, only it may more rightly be called a deconstructed lasagna, because it bares little visual resemblance to its neatly layered relative. It did, after all, come out of the crock-pot. The recipe was clipped it out of the San Francisco Chronicle this last month (at the moment I can’t track down the original recipe online, but when I do I’ll post it too). Coming together in just about half an hour, the remaining several hours of cooking time gives you the freedom to work on a craft project, clean the house, or write a ten page paper analyzing the management model of Amazon Inc. Can you guess which one I was doing? I will warn you that I had a little overflow problem; perhaps my zucchini was too moist, or my sauce too runny, I’m not sure, but my little 3 quart Crock Pot was full and I had to drain a little of the liquid part-way through cooking. I think if you made this lasagna in a larger Crock Pot you may not have the excess liquid issue and it might be a little more layered when it gets to the plate. If you try it, please let me know. Either way, whatever size Crock Pot you have, this lasagna should make its way to your dinner table soon! Lightly brown the meat, onion, and garlic in olive oil. Add tomato sauce and herbs. Allow to cook down, uncovered, just a bit. Add sugar, wine, and salt and pepper to taste. Adjust acidity to suit your taste buds with more or less sugar. Stir well and simmer. Ladle about a cup of meat sauce into bottom of crock pot. Break noodles to fit and add a double layer off noodles on top of sauce. Top noodles with half of cheese mixture. Add more sauce, a layer of noodles and remaining cheese. Layer spinach and zucchini over top. Press down and pour remaining sauce over top. Sprinkle with remaining mozzarella. Cover, cook on low 4 hours or high for 2 hours, until noodles are tender. Keep an eye out for overflow! Turn off pot and remove cover for a few minutes to let noodles and sauce set. 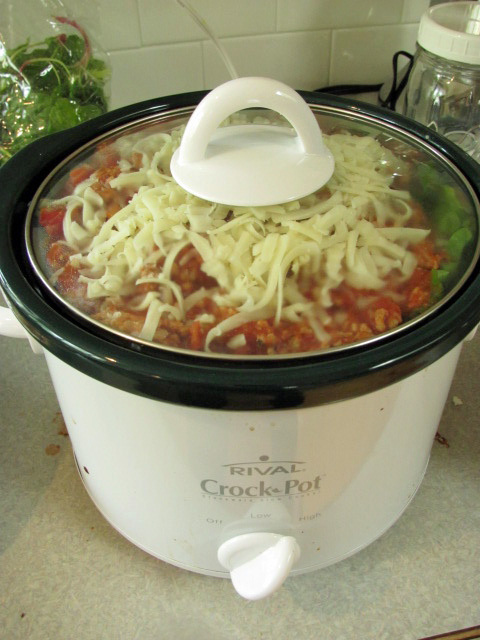 This entry was posted in Crock-Pot Cooking, Pasta. Bookmark the permalink. My mom served me some of her crock pot lasagna, and it blew me away! Pretty good for coming out of a slow cooker, huh? You know, when I put zucchini in lasagna (the baked variety), I always shred it with a box grater, instead of slicing it. Then you can squeeze the extra liquid out. Maybe that would help? Nice post! Greens sound great! That is one of the wonderful things about lasagnas, this one in particular, you can add almost anything. are all the herbs fresh? The only one indicated as fresh was rosemary. Lisa, You can use either. I think I used dried but if you have fresh I would recommend it for a more lively flavor. Yo Liz! I don’t know if Ky ever got around to telling you, but we printed out this recipe and gave it a shot the other night. It came out awesome. I just wanted to say thank you, and that I’m a secret fan of your recipe blog. Cheers! Great blog you have & glad you liked the recipe! This is in my crockpot right now!! Soo Excited!! I put it in a large crockpot and had no problems. However, I couldn’t find chunky tomatoe sauce, so I just used a can of tomatoes (with one can of paste) and it was a bit dry. Next time, I will use one can of paste, one can of sauce, and one can of tomatoes. I may add chopped mushrooms too, because we love mushrooms in spaghetti sauce at my house! That sounds great! Chunky tomato sauce can also be crushed tomatoes.